New three bedroom, 2 1/2 bath, two story townhouse. High end finishes and appliances, gas fireplace, cable television. Two queen beds, two twin beds. Fully equipped kitchen. Elegant furnishings, original art. Garage. Faces pond, next to yoga studio and bike path. Shuttle to mountain, less than 10 minutes away. 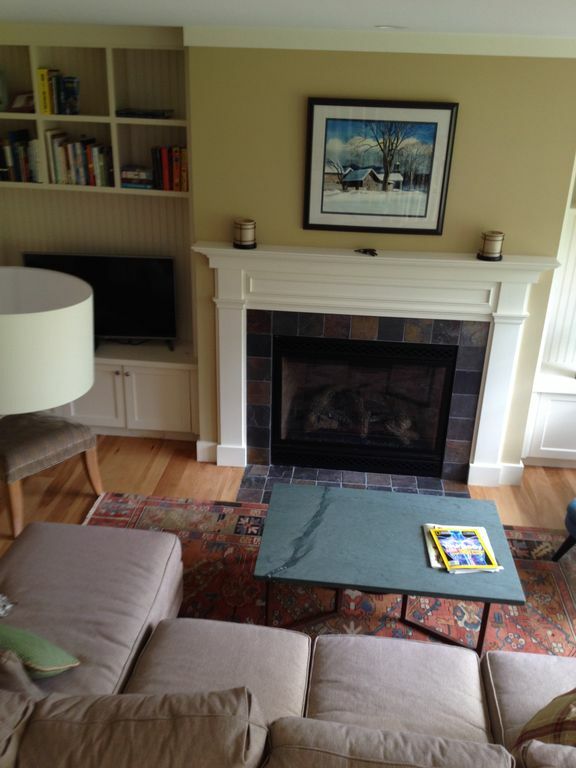 Purchased to be close to mountain and entertain guests in Stowe, not primarily as a rental. I am an native Vermonter and have skied on Mount Mansfield for 58 years! I am a graduate of Williams College and Boston University Law School and practice law in Burlington. We use the townhouse when it is not rented. My wife and I bought this property because of it's perfect location, near the mountain, near town, near the bike path, and in a beautiful setting. Stowe offers recreational opportunities beyond compare. The townhouse is more beautiful than anything else we could find in the location we wanted. The design and finishes of this townhouse gave it instant appeal, as the photos reflect. It is quiet, light and elegant. Great home, and perfect location for both mountain access and town restaurants. Hosts were very professional and accommodative, providing helpful tips and popular spots for anyone not familiar with Stowe. This was our second stay here and it was as clean and comfortable as we remembered. The location is great. Robert, the owner, is responsive and helpful. Hope to make it back next year! We had a great time. Very comfortable accommodation, well stocked with all the supplies and amenities we were hoping for. A great place to relax on bad weather days. Great location with proximity to mountain and downtown. Owners were very helpful and responsive! Stayed here for a few nights after Christmas. The condo is very nice , comfortable, well appointed and in a great location between the village and mountain. The owners were great and went beyond the call of duty when we lost the key to the condo on our first night there. I highly recommend this place and look forward to going back. This is an exceptional townhouse in a great location... just a short drive to the mountain and town. It is clean and comfortable with every amenity you could want! The owners were very nice, responsive and helpful. Highly recommend and we hope to be back again soon! I've been skiing at Stowe for 50 years and Bob's townhouse is an absolutely perfect, first class home away from home, you will not be disappointed. The townhouse is well furnished and appointed, very clean, comfortable, full of art, and will leave you with kitchen envy. Within 10 minutes to Mansfield/Trapp/town. Bob is a most gracious host, who was kind enough to offer us a late checkout - unsolicited. Thank you for that Bob and for sharing your townhouse, my daughters and I felt at home from start to finish.